Mark Wade, Head of Industrials and Utilities Research, discusses why ESG is more than just ratings application and how it forms a core part of the quantitative and qualitative analysis within the Allianz Global Fixed Income team. Hi, I’m Mark Wade and I head up the industrials credit research team within the global fixed income group at Allianz GI. ESG is a core part of our investment process, and it really provides us with the ability to protect ourselves from surprise downside events. ESG is about really understanding the investability of a country, a sector, a company or a bond, and really do I have an understanding as to this is a core part of our investment portfolio? Now this extends to lots of different factors that extend beyond just looking at the annual reports or company reports. ESG at the moment is being used as a ratings application, when really it’s a very core part of the qualitative and quantitative analysis of any risk position that you have in your portfolios. There’s a particular example from a couple of years ago which I think flags this very well. There was a very large issuer within the US healthcare sector. Our analyst met the company, had attended some conferences, had a good understanding of the industry, and it became clear to her that this was a company that was struggling to deal with competitive pressures, a changing sector landscape, there were financial risks relating to covenants, and all of this was happening at a time when there was turmoil at senior management. Through this, we decided just to get out. We didn’t try to second guess the timing of the problem, and we got out well ahead of any bond correction and certainly well ahead of when MSCI and the rating agencies eventually decided to downgrade the company. Historically, fixed income analysts have had less corporate access than our equity colleagues, but that is changing. Also at Allianz GI we are privileged in terms of our ability to have access to companies. And that extends not just to the credit analysts; it’s to the ESG analysts and the equity analysts. 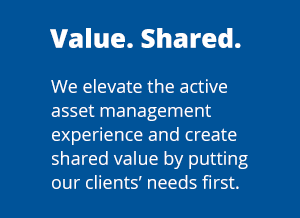 And through that collaboration it allows us to have an understanding of the risks in different asset classes. It allows us to identify key red flags, and because we are a global company we can take examples from other regions and map it onto our own region. There will be a core change, and it will be moving away from a ratings-based application to portfolio, either in terms of inclusion or exclusion, and it’s going to be engagement with companies on these topics. How they deal with these issues, what is the transparency around these issues and really trying to protect yourself from the downside risks when they can manifest themselves. As and when the market turns, the market is going to focus on winning by not losing, rather than on the upside, and ESG is going to be a core part of the armoury to protect portfolios against that downside. In summary, while ESG has being embedded in our process for years, we believe that greater engagement on ESG by the investment community will provide a far better backdrop for downside protection in what is likely to be much more challenging market conditions.